Historic and public figures have always been tempting subjects for musicals. Some are remembered today only because of them--who'd know the Von Trapp Family now but for The Sound of Music? Yet it seems you can't write a biographical musical without playing fast & loose with the facts. Much of what we "know" about Annie Oakley, Gypsy Rose Lee, Fiorello LaGuardia and Fanny Brice is artistic license burned into legend. That Margaret Tobin Brown was a fascinating woman is beyond question; that her fame was reduced to that of a pioneer social-climber who took charge of a lifeboat at the sinking of the Titanic is rather short-shrift. But then again this is a musical comedy. An irresistible character by her sobriquet alone, "the unsinkable" Mrs. Bown would scarcely recognize herself from the tuner the Theatre Guild initiated in 1957. Richard Morris's libretto fancies her a motherless, nearly feral, Rocky Mountain hillbilly, in relentless pursuit of wealth and society. That she eventually comes to her "senses" for love does little to disguise the shallowness of her evening-long ambitions. The second act is almost entirely devoted to avenging a snub by Molly's snooty Denver neighbor. 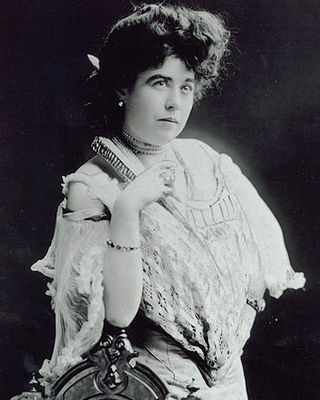 You'd never know that the real "Maggie" (not Molly) Brown was from a large family in Missouri, worked in a department store (not a saloon) in Leadville, Colorado; had two children by husband, J.J. and was a longstanding philantropist, suffragette, and children's advocate. She even ran for the Senate, twice. Photographs suggest a figure from the pages of Edith Wharton, not the Colorado Calamity Jane turned self-starting Eliza Doolittle. She was no beauty; few who've played her resembled her even remotely; tho Kathy Bates comes closest. With a lifespan from Reconstruction to the Depression--there's a great deal of story in there. But Richard Morris takes such great liberties with her bio, he might as well have changed her name, like "Sally Adams" stood for Perle Mesta in Call Me Madam. 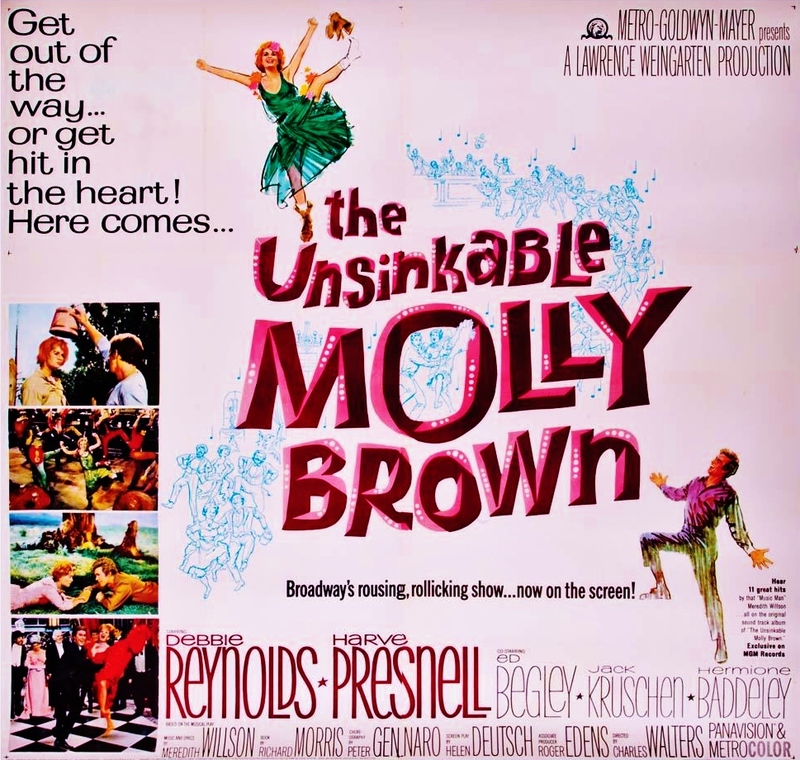 But then it's such a great pioneer name, Molly Brown. Preface that with "unsinkable" and it already sounds like a musical. I think I've hit on why Molly Brown never fully pulled itself together. Who's the muscle here? It's tempting to say it's Meredith Willson, on the heels of his Bway breakthru--but this isn't his own integrated conception, but a score for hire. Certainly it's not Richard Morris, whose book is a jumble of cut & paste. It's not the Theatre Guild -- producing, by committee, one of their last productions; nor is it Tammy Grimes, who rises here to stardom. So it's got to be co-producer and director, Dore Schary. Dore who? Know-it-alls can cite Schary's authorship of the FDR-gets-polio drama, Sunrise at Campobello, or remember his five year reign as head of MGM ('51-'56), or his "cameo" (portrayed by an actor) as the studio head on I Love Lucy. But as the muscle behind a Bway production, Schary wasn't exactly a Robbins, a Kidd, a Logan or Champion. Molly Brown feels like show pieced together from separate departments; missing that overall central vision necessary for cohesion. Too many moments recall scenes from other shows from Oklahoma! to Gypsy--which is apt, I suppose, if you consider Molly Brown a culmination of the genre. It opened on Bway in the fall of 1960, five days before Kennedy defeated Nixon. It was a season of sky-high expectations. New musicals were arriving that were follow-ups from the heralded creators of Fiorello!, The Music Man, Gypsy and My Fair Lady. David Merrick beat them all to the punch in late September with his London import, Irma La Douce (the beginning, really, of the British musical invansion--but then we were about to be invaded by all things British). Inevitably, Tenderloin, Molly Brown and Camelot disappointed, as did Lucille Ball's bespoke vehicle, Wildcat (with a similar period adventuress). By the time Merrick brought in Jule Styne's Do Re Mi at Christmas, the critics overcompensated with praise, but none of the shows lived up to the heights set by their predecessors. (Bye Bye Birdie, a latecomer from the previous spring would win the Tony). 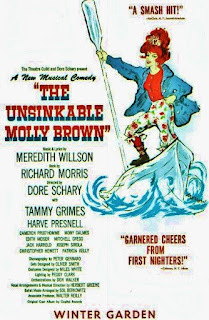 Curiously, Molly Brown, alone of all these shows, never had a single sold-out week on Bway; but played over 500 performances at the Winter Garden and was easily sold to Hlwd. It was, as they say, a 'natch' for pics. Meredith Willson's score starts out like gangbusters--suggesting the music man's brilliance undiminished. "I Ain't Down Yet" is a rousing march with dizzying octave leaps; an opening/wanting song that's the very opposite of pedestrian. It defines the show as successfully as "76 Trombones" did Music Man. Quick on its heels comes "Belly Up to the Bar Boys," a rowdy saloon chant set in a Western idiom that also serves to brand the show. The first ballad, "I'll Never Say No," (written entirely in a Palm Springs pool) is somewhat old-fashioned but lovely all the same. But once the show heads from the hills, Willson's inspiration quickly lags. Denver is no River City, and Molly's plea for charity, "Are You Sure," evokes Harold Hill's "Trouble" without making its impact. The long European sojourn in Act Two feels like so much filler--as does the music until a brief burst toward the end. I'm referring to the lovely Monte Carlo waltz, "Dolce Far Niente," which doesn't survive the transition to screen, cut along with another ten of the show's musical numbers--making this one of the biggest gut jobs of a Main Stem musical in years. Only six numbers from Bway were retained, including the lyric-less dance, "Up Where the People Are" and "Colorado, My Home" which for most would be a puzzle, as it remains only as part of the overture on the OCR and nowhere in the published libretto. Ostensibly it's a "new" song, tho the promo materials all cite "He's My Friend" as the film's sole addition. 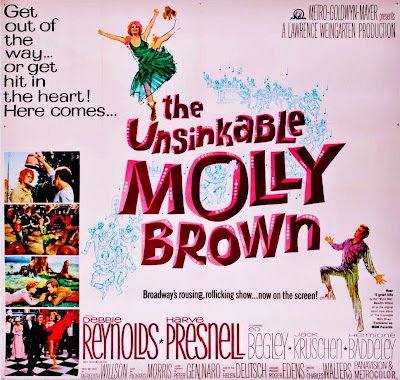 It says something about the strength of the half dozen songs in MGM's Molly Brown that you scarcely notice how scarce the music is. But then there's a nice amount of underscroring, which includes melodies from a number of the cut songs: "Chick a Pen," "Beautiful People of Denver," "My Own Brass Bed," and happily, "Dolce Far Niente." 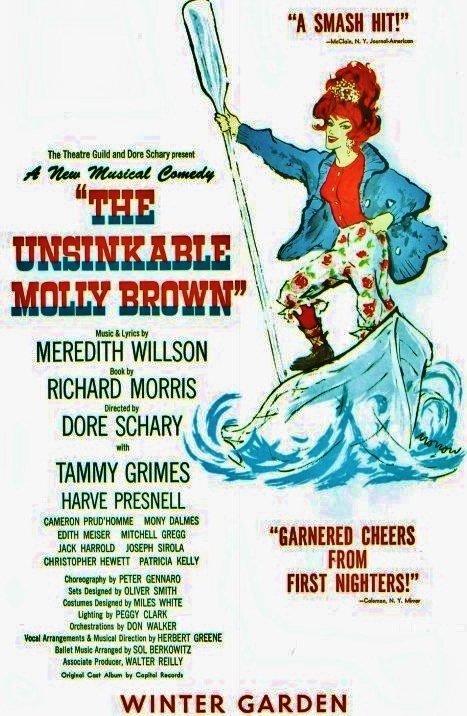 Twenty years earlier Molly might have been another choice role for Merman, (or even--think about it--Shirley Booth) a brash, big-hearted comic personality, with a musical comedy voice. In 1960 that could've been someone like Susan Johnson, or why not Carol Burnett, coming off her Bway debut? 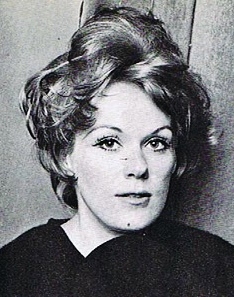 The unlikely choice of Tammy Grimes gave the show its curve ball, its intrigue. Less a rowdy mountain woman than ethereal pixie, Grimes was so thoroughly against type she surprised the critics and won a Tony (as "featured" actress--featured in nearly every scene). 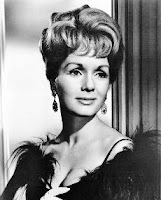 She'd been bouncing around in search of a hit; handpicked by Noel Coward as an ingenue for one of his latter-day flops, she later made good as the ghostly Elvira in High Spirits and won another Tony in a revival of Private Lives.) But nothing about her ski-jump nose or clownish, if somehow glamorous, face tempted Hlwd. Feistiness and determination shine thru in her portrayal of Molly, and her enthusiasm is undeniable but it is such a broad, hammy performance; obvious and quickly grating. The way she stomps and swaggers, her fists always socking the sky is so emphatic it reminds you of silent film acting. But, alas, there's plenty of sound. Before we even see her, or her infant-self shooting rapids in a crib (in screenwriter Helen Deutsch's fantasy prologue) we hear baby-like gurgles suspiciously in Reynolds' voice. She was known for her impressions (Zsa Zsa, Marlene, Judy etc.) which inspired someone to unleash her catalog of vocal effects mercilessly on the soundtrack: whimpers, moans, cackles, coos, mutters, gasps, groans--enuf to stock an audio file at Hanna Barbera. It's a performance that on stage would be accused of "chewing the scenery"; here it's "nibbling at the celluloid." By her own definition, a "vaudevillian" rather than a singer, she favors yelling in her numbers, which really only total three. Of the first, the buoyancy of the song ("I Ain't Down Yet) against the stridency of Reynold's rendition makes it a draw. She really goes to town in "Belly Up to the Bar, Boys," dressed like a Christmas tree, kicking up her booted heels. But she's at her best in "He's My Friend, mastering a jig as if Kelly & O'Connor were still by her side. If not her best performance it was surely the pinnacle of her screen career, and she fought her way to an Oscar nomination--her one invitation to the ball (edging out Audrey Hepburn in My Fair Lady, but losing the crown to Julie Andrews). Harve Presnell was an Opera singer who had never seen a Bway musical before he was hired to partner Tammy Grimes. He had equal inexperience with Hlwd, so it's a bit surprising he's the sole performer invited from Bway. But with his strong baritone voice, and virile looks (tho a bit horsey for my taste) MGM was sold. Both he and Reynolds would reprise their roles on a national tour nearly 30 years later (the somewhat patethic, if commercially viable Greatest Hit regurgitation that becomes an only option at a certain age: see Brynner, Yul; Channing, Carol.) You'd think that Audrey Christie's snobbish Gladys McGraw would get first featured billing, given that she's the lynchpin for nearly everything Molly does in the second half of the story; so it's shocking how far buried she is in the credits (18th!) --while Hermione Baddeley, playing her mother (a newly invented character for the film, Buttercup), gets featured billing. Christie, who was terrific as Mrs. Mullins in Carousel, is no less effective here. The most emotionally satisfying moments come, not from the push/pull of the love story, but in the comeuppance and rapprochement between Molly and Gladys. Ed Begley is oddly appealing as Molly's "Pa," Shamus; a name suiting his hillybilly hotfoot and beaverish grin. It's astonishing how this same mug could be so welcome here and so repelent in his recent Oscar winning role as a vile politcian in Tennesse Williams' Sweet Bird of Youth. Aside from providing Shamus with a mate, Baddeley's broadly Irish frau exists only to justify Molly's need to bring down Gladys. 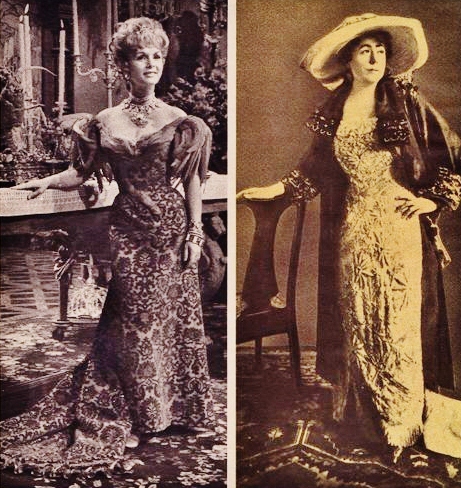 Martita Hunt, (Bway's Madwoman of Chaillot, and Miss Havisham in David Lean's Great Expectations.) is the Grand Duchess; looking remarkably as if sprung from a Mary Petty illustration, moving as a porcelain wind-up doll. She does a half-size Charlotte Greenwood kick in the runway section of "He's My Friend," the film's most exubert, most satisfying number by far. Each of the characters gets to strut their stuff before the horrified Denver society crowd, and they all do so with gusto. But the song ends with Debbie partnered with Grover Dale & Gus Trikonis (two Bway dancers; the former husband to Anita Morris, alleged lover of Anthony Perkins and father of current rising star: James Badge Dale; the latter Goldie Hawn's first husband during her Laugh-In/Cactus Flower days--but we digresss...) Debbie and the Boys finish off the long, and very welcome production number with an accelerated jig--she lifting the folds of her gown to free her flying feet. The final minute is one long take that in its unaltered, unobstructed view, generates a visceral excitement that would otherwise be lost with editing. Filmed dance is now so commonly chopped into bits so brief the brain can barely register each angle or any natural movement, before moving on to the next. Cinematically, "He's My Friend" might be considered old-fashioned, but it earns its momentum authentically, and bears repeated viewings. It's a real gem buried in a film I've not thought much about. The movie as well as the show, was choreogrpahed by Peter Gennaro--who once partnered Carol Haney and Buzz Miller for Pajama Game's "Steam Heat," taught Judy Holliday to cha-cha in Bells Are Ringing; and staged "America" in West Side Story. Tho one of his Bway dances, a scene-changer with Denver policemen is easily dropped, and another, the Riviera turkey trot is seen here abridged, "Belly Up to the Bar" is a real rouser. Midway, the number is invaded by three hookers, who do a sort of wordless version of "You Gotta Have a Gimmick"--the reference made even more explicit as it's led by Bway veteran Maria Karnilova (Gypsy's original Tessie Tura--made up frighteningly like her kabuki-painted Madame Hortense in Zorba) in what was virtually her only screen apprearance; just weeks before taking on her greatest role, Golde to Zero Mostel's Tevye in Fiddler on the Roof. The inescapable title-defining moment got by on stage as a tableaux vivant--a brief, audience-coddling coup de theatre. On screen it's another matter. The sequence sputters, beginning with a campy shot of Mol, wrapped in blue fur, her eyes widening in horror, as ice cubes are thrown at her feet. Cut to the lifeboat, already at sea, with Molly taking charge, spewing bromides in bits of previously-heard lyrics, and extolling the survivors to sing. Well, where's the song? Isn't this a real, "Sit Down, You're Rockin' the Boat" kind of moment? Too literal perhaps--but even a reprise of "Belly Up," which is hinted at, would be better than nothing. It's a scene carelessy conceived and seemingly begrudgingly made. The movie opened around the country on June 11, 1964 but not until early July at Radio City Music Hall, where it ran for a smashing 10 weeks during a very busy tourist season in New York: the first summer of a two year World's Fair in nearby Flushing Meadow. This on the heels of a Bway season that was one of the busiest and most exciting for new musicals, and featured the most stunning array of female musical talent Bway will ever see in one season: Mary Martin, Barbra Streisand, Bea Lillie, Carol Channing, Janis Paige, Angela Lansbury, Carol Burnett, Barbara Cook, Lee Remick, Inga Swenson, Florence Henderson, and even the first Molly Brown: Tammy Grimes, all appeared in musicals of '63-'64. Whew! By the start of summer, Hello, Dolly!, Funny Girl, High Spirits, and Fade Out Fade In were all SRO, and Golden Boy and Fiddler on the Roof were on the way. The Beatles (and the flood behind them) were shaking up culture and the zeitgeist, but the Bway musical was looking never more healthier whether on stage or screen. Molly Brown went on to make $7,500,000 in rentals, making it #3 movie the year. That was but a hint of the money and acclaim that would grace the next three screen musicals coming soon after. Here's another rare instance of a musical I saw first on stage, in early '66 at our local theater-in-the-round, with Jane Powell and Bruce Yarnell (the B-list Harve Presnell). I remember little about it aside from Molly's drawn-out charade of stashing her new fortune (and settling for the stove). My mother, who--generously said--was of simple peasant stock found it especially amusing. She gamely tried to join in my delight of musicals, but never--to my evidence--had a spark of passion for anything cultural. I was on my own in these pursuits by the time I caught up with the movie in 1970--on the Cinerama-wide screen of our geodesic-domed Century theatres in San Jose. Few musicals offer such a wide, colorful palate. The location scenes of the Rockies are breathtaking (if you like that sort of thing--something about Colorado has never appealed to me); and just as monumental is the art direction of the Brown's mansion in Denver--done up in whorehouse red and looking the size of a train station. The movie starts out like Annie Get Your Gun and winds up looking like My Fair Lady--along the way recalling a head-spinning catalog from The Music Man, to 7 Brides for 7 Brides; Li'l Abner, Destry Rides Again, Paint Your Wagon, Carousel, Fiorello! and a first act closer that suggests nothing so much as the "Shall We Dance" moment from The King and I. And just when you think it covers everything but West Side Story, there's former Shark, Gus Trikonis, playing one of Molly's brothers. 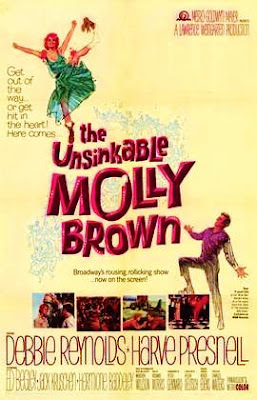 It would be unfair to say The Unsinkable Molly Brown hasn't enuf of its own identity; it does. But it sure reminds you of a lot of other musicals. And is that so bad? New Songs: 2 "He's My Friend"
Worst Omission: "Dolce Far Niente"
Standout Number: "He's My Friend"
“Belly Up to the Bar, Boys"